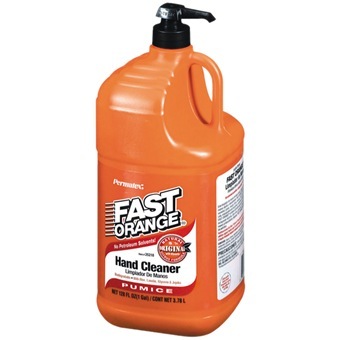 PERMATEX FAST ORANGE HAND CLEANER 1 GAL is rated 4.7 out of 5 by 3. Fast Orange® Hand Cleaner, the #1 selling, biodegradable, waterless, petroleum solvent-free hand cleaner is now infused with MicroGel™, a patent-pending hand cleaning technology developed by Permatex to make Fast Orange® even better! Rated 5 out of 5 by n0t4sh0w from AWESOME! tried most hand wash to clean my hands from oil and grease but doesnt work. this stuff is super awesome. will clean your hands effortlessly. smells good too. Rated 5 out of 5 by Khye from Fast Orange Removes grease easily and instantly without much effort,highly reccomended for personnels working as mechanic and technicians!